It all started three weeks ago. 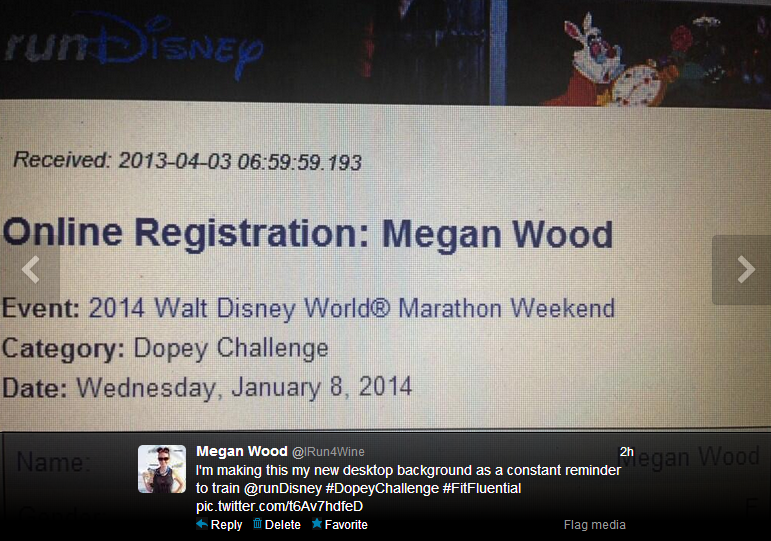 I was working in our Orlando office and my co-worker/friend/running buddy Nicole mentioned a rumor she heard, that runDisney was adding an official Dopey challenge to the 2014 Walt Disney World Marathon Weekend. I put my foot down, no way am I doing this. That was even before Active leaked the price at $500 for 4 races. It's hard to imagine that three weeks ago, I still had my sanity in check. Yet here I sit on April 3rd, the day of early registration for Disney Vacation Club members and Annual Passholders to pre-register for the Disney Marathon Weekend. The above registration confirmation is glaring at me every time I look at my desktop. 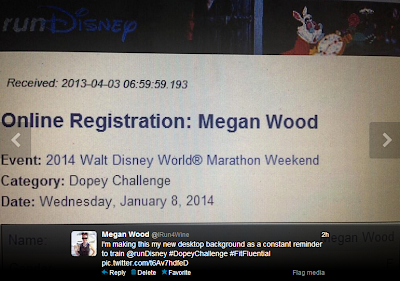 It's official - I am running the Dopey Challenge during Disney Marathon Weekend. Four days, four races totaling 48.6 miles! I will run the 5K, 10K, Half Marathon and Marathon. Over the next 9 months, I will entertain you with my training.....and the outcome of this race. This madness was caused by Nicole and my friend Rachel (runnerstales.com). Over the past week, I've been in constant contact with these two girls regarding early registration. At 8am this morning, I received a call from Nicole, who sat on the phone with me until I hit that confirm registration button. She knew if she hung up, I would chicken out and I would be experiencing Dumbo Double Dare Drama II (the race sold out in an hour and I have been pouting since for not registering early). Within minutes, I get a text from Rachel "I cannot believe I just did that" who got a response from me of "I am going to go watch Snow White now so I can curse Dopey out". All day long, I have received a ton of congrats tweets from friends and complete strangers. Congratulating me on my madness. Meanwhile, my mother called me Dopey and even asked if I was on said substance when I registered . I look at my bank account and know that the Tory Burch handbag I was planning to purchase with my bonus has been replaced with running 48 miles over 4 days. 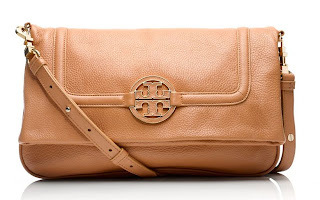 Bye bye Tory Burch Amanda Messenger, you are no longer joining my purse family. Instead, my runDisney medal collection will grow by 6 and I wont be able to walk for the entire 2nd week of January 2014. Finishers of the Dopey Challenge will be awarded a Dopey Challenge medal, the Goofy Race and a Half Challenge medal and a medal for each of the four runDisney races we complete that weekend. After signing up, my friend Darlynn (thelittleblogdress.com) called me during one of my 20+ panic moments I've had since I confirmed the Dopey registration. I was hyper and didn't allow her to get any words in (with the exception of "you are going to die"). 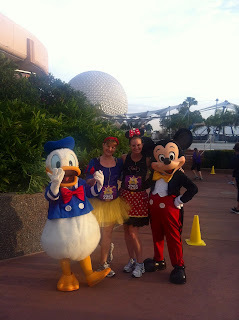 Somehow, I ended up coercing her to sign up for the Disney World Inaugural 10K. Darlynn has been an avid "I never want to run more than a 5K" runner since she started running a year ago. I knew somehow I would get her to move past the 5K mark. Who knew the words "Minnie Mouse Medal" would get her to do it. I am so happy she is taking this journey with me! Who is next on my registration war path? My Mom! She doesn't know it yet but I am going to register her for the family 5K fun run. ...and you are NOT going to die. You are going to be a rockstar!